Fostering the love of learning through immersion. I was selected to be an assistant principal – a coveted position in my district for sure – as my first step into administration. One month into the school year, I knew I was in a professional situation that would test my ability to apply my carefully studied ISLLC standards to the real test. With my new position as an AP, I felt like I had landed myself on one great vacation spot at the beach looking at one huge, impending storm. One month later, my principal was removed from duty. Our staff was surprised, but not really. Our district leadership decided it was best to allow the two assistants to lead the school as co-principals. I do believe I lived one of the shortest assistant principal tenures on the planet. The conversations were rigorous about who we bring to the table to lead the school in such tough times. The school had departments with powerful and politically aligned department chairs – an old guard of sorts – that protected the traditions of our locally popular high school. The school had also started down a path of transition to become a Professional Learning Community with identified coaches who were not necessarily department chairs but carried a clique of teachers with them on an appropriately identified track of learning. How did we organize this team? What personal agendas did we allow or disallow in leading the school? What would be the fallout if we did not include a known “Big Fish?” What teachers and teacher leaders were truly qualified to be decision makers for their peers. The options were endless. Our decision was to center our leadership team around the department chairs. We felt these individuals were, or at least should be, strong content knowledge teacher leaders who would help us keep our decision-making focused on what was best for our students academically. Our school has 12 department chairs on the team – four core (MA, LA, SS, SC), five electives (FL, FA, IT, FACS, PE, BUS), counseling and library. We obviously added our admin team, which included our Activities Director and an assistant principal in the subsequent years), on the leadership team as well as our instructional coach. As it turned out, the PLC coaches were not pleased with our decision. The tough conversations about our decided leadership direction provided a first conversation in what was about to become one exhausting marathon of conversations. We brought the team together. We studied how to be a good team. We studied how dysfunction would affect us. We studied data. We wrote our School Improvement Plan using our leadership team to lead the staff. We believed in a vision and mission and made it our own. Together, we suffered through a pounding by the press and a drop in state testing scores. We developed policy (cell phone usage and tardy) together that began to change the way we offered learning and managed classroom behavior. We grew as a team, but it often felt like we were rowing the Titantic. We felt like we were moving. We added an “At Large” member to our leadership team who was a teacher voted on by all the teachers to represent them on the Leadership Team. The tenure of that position was one year to offer the opportunity for any teacher looking to grow leadership experience. We also made a super smart decision to add our Professional Development Committee members to the leadership team. This decision was made based simply on the fact that the leadership team was making PD decisions they didn’t want denied. It was logical to include the voting PDC members a part of the decisions and save a step. Smart leaders, eh? So, despite NCLB goals increasing at an unprecedented rate (or at least it felt like it), our leadership team stayed focused on our school improvement and continued to study how to make our students better learners and more successful community members. We pulled together to earn NCA-CASI accreditation – a team building experience if I’ve ever met one – and we earned a humbling US News & World Reports Best High Schools 2009 Bronze Award. 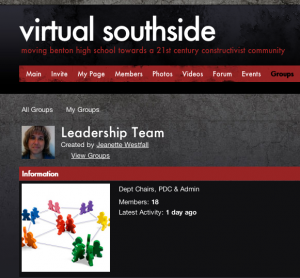 We were selected by the district to pilot technology integration with pedagogy and content knowledge, and Virtual Southside was born with ensuing success and a tremendous professional impact. The leadership team was pulling the staff to earn some great wins. Then, with little warning, much of our hope was dashed when our community decided to withdraw their financial support and not renew a 63 cent levy our district used for basic operations and salaries. When a strong leadership team exists in a high school, adversity only makes you stronger. We were rock solid. We had our third start of school leadership team retreat today. We battled over our literacy plan. We focused on reaching each student personally with our ready-to-launch CAMP (Cardinal Mentoring & Advisement Program). We will grow our school spirit by including every teacher and every child in activities and class acclimation. We grow every time we meet together — we have a plan for that which includes bi-monthly leadership team meetings, monthly department meetings, and monthly job embedded professional development on TPACK. Our conversations are vocal and passionate now — the transformation to instructional leadership within the team is exciting and dynamic. We will succeed, hopefully with the levy, because we believe in our vision: Success for all through education!